Comodo Internet Security records a history of all the CIS tasks like virus signature database updates, scans run and so on. The 'Tasks Launched' log window displays a list of tasks launched at various time points with their completion status and other details. 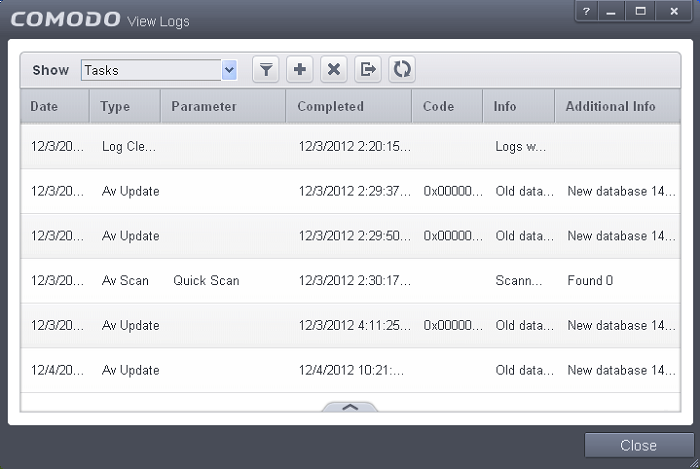 The 'Tasks' logs can be viewed by selecting 'Tasks' from the 'Show' drop-down of the log viewer interface. Date - Contains precise details of the date and time when the task is launched. Type - Indicates the type of the task. Parameter - Indicates the parameter (like scan type) associated with the task. Completed - Contains precise details of the date and time of the completion of the task. Code - Indicates the code of the task as assigned by CIS. Info & Additional Info - Provides additional information of the task. To export the Tasks logs as a HTML file click the 'Export' button . To refresh the Tasks logs, click the 'Refresh' button . To clear the Tasks logs click the 'Clear' button .